2 Bigfoot Caught on Tape in Mississippi? 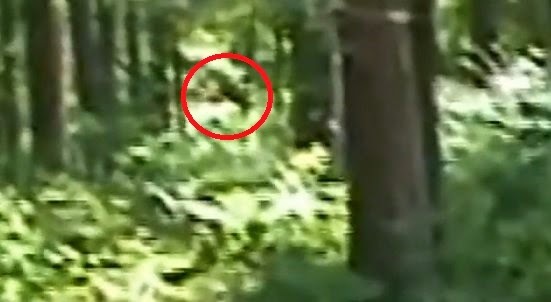 Is this 2 Bigfoot caught on tape or just another case of pareidolia? The filmer thought he may have captured a Bigfoot on tape, and upon further inspection The Crypto Crew seems to think there are actually 2 Bigfoot in the footage. At the same time there seems to be a lot of dark spots/shadows in the area that are moving in the breeze. This incident occurred on July 16, 2014. Watch as The Crypto Crew slows and zooms the original video. I honestly do not know what it is! I never said it was a Sasquatch because I do not know with 100% certainty. I do know that it is interesting though. I caught this after hearing rustling and a wood knock. It is in an area where I have had many other wood knocks and activity.